CCL carried out the post-tensioning design of all horizontal floor plates and installed its XF multistrand flat-slab system, using 39 tonnes of 12.9 mm diameter strand over four levels. A 210/250 mm post-tensioned flat-slab solution was proposed throughout the building, producing thinner slabs than traditional reinforced-concrete construction, maximising floor-to-ceiling space, and enhancing the open and exposed look required by the client. The company also designed the cantilevering transfer beams that would provide an opening at ground level and accommodate high differential deflection at the edge of the floor. For CCL, a key feature of the project was the inclusion of fair-faced soffits. The company designed pour sizes to suit board layouts so that visible joints were created in the exposed ceiling, highlighting the suitability of post-tensioned slabs for fair-faced soffit applications. The five-storey council building will provide 120,000 square feet of low-energy, open-plan office space around a central atrium. 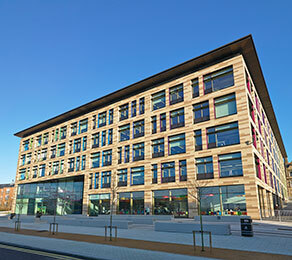 The £14.8 m complex was designed to BREEAM ‘Excellent’ standard.